You’ll enjoy this tasty morning indulgence that is good for you too! 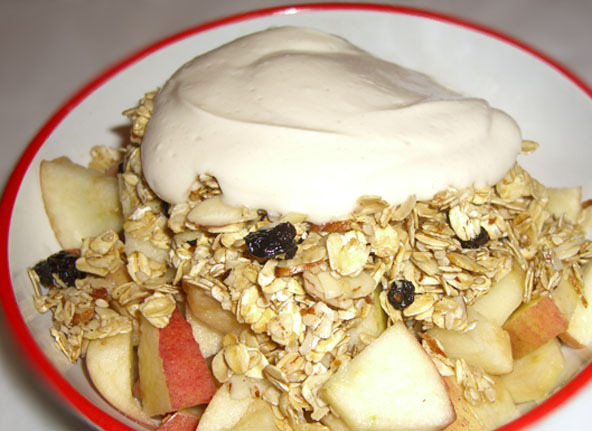 Fresh apples with a lemon twist, topped with a quick-to-assemble granola that beats all in it’s raw form. The Cashew Cream is supreme and a wonderful non-dairy cream replacement, which is also excellent topped on crepes or pies, or chilled for a fruit dip It can be varied with other raw nuts such as blanched almonds too! Use what you have and enjoy the rich creamy flavor and combination. In medium bowl, toss prepared apples with lemon juice (or water and lemon oil). To prepare Raw Granola, combine all ingredients in a bowl; toss well. Uneaten granola can be stored in a covered container for later use. For the Cashew Cream, combine all ingredients in a blender and blend very smooth, 1-2 minutes. Use as you would dairy whipped cream; chill remaining cream for a yummy fruit dip later. For each serving, assemble in individual bowls; diced apples, top with granola, then with Cashew Cream. Enjoy!